Home » Did you know there's a positive side to shame? » Did you know there's a positive side to shame? Did you know there's a positive side to shame? Title: Did you know there's a positive side to shame? Did you know there's a positive side to shame? What if shame wasn't all bad and had a purpose that we had missed... wouldn't you want to know what it is? Here's the thing... in order to recover, to grow and to get to our next level it's important to stop making ourself wrong and start understanding that we are perfectly made. And when we start to understand why shame is there and what do do about it - everything starts to change. Shame is something everyone experiences at some point. Labels: Did you know there's a positive side to shame? “I can’t think properly” . Our Child Within describes its thought disorder from the inside. a defect in spirit or a personality disorder. A dissocialised parent will trample all over their family to address their own desires without giving much thought to what anyone else needs. A Dissociative parent is a parent affected by or Dissociation personality disorder. a great lack of something. A meditation for developing loving-kindfulness towards the Self. abusive or dissociated families assume unhealthy roles to help us survive those childhoods. adapting ourselves to fitting in or being a rebel and standing out – all of these behaviours stem from our thoughts about what other people think. Addressing the root of our shame – and our trauma – is the only way to recover. and I can't tame it any more. and it can leave us feeling less than kind. and let ourselves freely associate to the answer. and you will see that this is what is taking place. Anxiety is the body’s way of responding to danger. It’s a survival mechanism designed to keep us alive. any consciousness of his own self. Anybody can awaken to the truth of full recovery. As survivors of abuse we act out sexually and become promiscuous. as they are passed unconsciously through our generations. As we awaken from the child’s within nightmare of despair we begin awakened living. As we unconsciously deny an unstated and intolerably poor self-image through constant dissociation. At the core of all addictions is abuse. Avoiding the deepest levels of pain is part of the old fellowships mentality. Bringing into our minds the powerful redemptive quality of the ten stage program. but rather the result of a series of developmental adaptations in the brain to a difficult early life environment. Change is best cultivated in fertile soil. Befriend and teach. Chaotic Disordered Societies are not safe for our child within. Child-Within-Expression is a process of gentleness and self-acceptance. Childhood dissociation in any form violates a child at their core. DAs no longer neglect our child within for we have learned to come home to ourselves. Depression is connected to our unhealed emotional trauma. Dissociation Anonymous Authentic Recovery is generic. Dissociation Anonymous Child Within is not some fad or pop psychology. Dissociation Anonymous has found that behind every addiction lurk unmet needs from childhood. Dissociation Anonymous is a flight from sorrow? 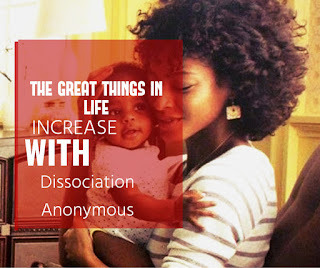 Dissociation Anonymous is about having a dysfunctional relationship with the anonymous me! Dissociation Anonymous is not constructed to promote likes or fans. Dissociation Anonymous recognises that The industrial model of education is a form of social engineering that has created many problems in our world. 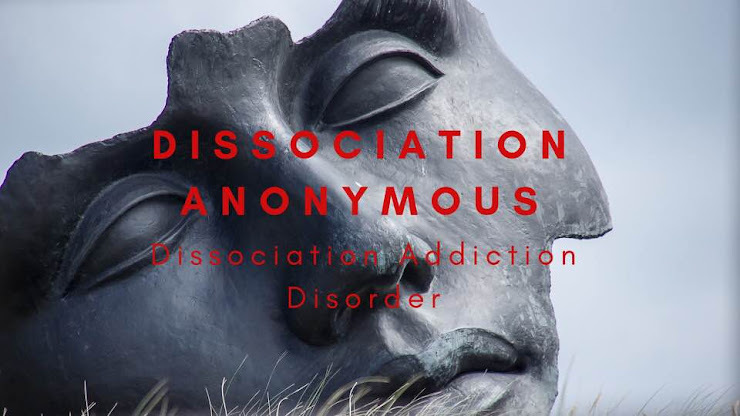 Dissociation Anonymous where does the everyday self go during active cycles addiction? Dissociation Grandiosity comes from shame; it’s a cover-up for deep feelings of inferiority. Dissociation has logical impacts and those impacts can be reversed one at a time. Dissociation is at the root and branch of all our problems. Dissociation is emotional and behavioural defence system which we adapted in early childhood to help us cope and physically survive. Dissociation is vicious powerful form of delayed Stress. Dissociation Program is simply the direct recognition and understanding of how things actually are. Dissociational escape is being modelled constantly in the media. Dissociationalists feel like other people are an extension of themselves. Dissociationalists find that we do the most significant damage to those around us. Dissociative children are safe to un-awakened parents because they do not threaten their dishonest authority. DISSY The illusion of dissociation is the label of addict or alcoholic. Dissys Ten Stages have become a universal pathway to healing our ancient ancestral emotional wounds. Do you have a Child Within Group? Duality we had to accept on a subconscious and emotional level the values that were imposed on us as children. Ending The Legacy of Dissociation Disorder! Escape from Anonymity Aware now that in any life situation we have choices and rights. EVERY 30 YEARS OR SO IN RECOVERY WE EXPERIENCE THESE GIGANTIC STEPS FORWARD. AND Dissociation Anonymous MAY WELL BE IT..
Every-time we disrespect a child thats abuse. Its not difficult to understand we can all relate to it and we all need to acknowledge it. Everything that happens to us is a reflection of what we believe about ourselves. Expectations can be one of the dirtiest words in the recovery language. Fear locked the doors of our Child Withins Hiding place. From the ultimate viewpoint there is no view whatsoever. Here's the truth... not everyone will like it. Honesty is raw power which breaks us from the shackles of this world. Honesty is the channel of truth between recovery and mind at the ten Stages. How do you mix loving with kindfulness? If we had called Dissociation Anonymous Addiction Anonymous or Alcoholics Anonymous. if you want to stop dissociation you've got to make friends with immobilisation and realise that it won't kill us to slow down. In Dissociation Anonymous we needed to start letting go of dissociation and start learning how to be in recover the moment. In movies and dramas – our heroes and heroines have giant epiphany moments when they realise life is slipping away from them. In the maternity wards of Western civilisation there is little chance of consolation from wolves. Infuse our life with recovery action. insisting that it is not true despite what may be overwhelming evidence. Intulexia is inherent parts of us: it make us human. INTULEXIA: To reject gods and spirits is easy: just bully them away in the name of science. is not an intellectual concept. Is there such a thing as sugar addiction? It becomes necessary to own and honour our perfect child within us who we are in order to awaken ourselves to the real you. It sometimes feels as if we are living someone else’s life. It's scary to put our real self our child within out there. Kindfulness and self loving-compassion – it is no exaggeration to say that it has renewed my life. Kindfulness is available to all. Learning Loving-Kindfulness solutions are linked to less anxiety and depression. Letting our mind rest in our ten stage sayings. Living with or being involved with dissociation can be mentally and emotionally exhausting. Loving kindfulness is where you come from and It is your birthright. Many of us are co-dependent and Dissociated. Mediative working within the ten stages meetings unleashes a pure font of well-being and safety for ourselves and others. new variation on the recovery theme of being human. No Recovery was ever accomplished in the Comparison Lane. not our problems in our life. Notice in Zenquillity how we feel when we receive love. Often the ego’s voice will sound logical and rational. One of the definitions of acquired dissociation deficiency is fundamentally it is a fear of being true and authentic towards ourselves. or become willing to acknowledge it the dissociation escapes we play are an attempt to exert control over our life and our relationships. or history is lauded in our troubled recovery world as health. or physical abuse in our childhood. Our beliefs about ourselves are the result of our early experiences. Our definition of our child abuse is simple: whenever the spirit of our child is disrespected the child is abused. Our human condition is not always easy. We have to pretend we are interested in things we are not for the sake of social convention. Our lives matters. Choosing Dissociation Anonymous will bring us great joy and great recovery. Our mission here at Team DA is to end emotional Dissociation trauma in our life time. Our unchosen dissociative relationships are relationships with family members who suffer from dissociation disorders. private space and time for writing. Really we need a child within us who loves us fully. Remember that an episode of stigmatisation isn’t about you. restrict and disconnect us from who we are. Seeing ourselves in pain is our cue to practice compassion. Seeing the relevance of incorporating new ideas is one massive anxiety ridden conflict. Self Survey: End The Legacy of Dissociational Disorder! silent voice inside of our mind. so it’s really the ancient language of humanity. Suffering is one of the undeniable facts of life that motivate our practice. that legacy may affect us in multiple ways. The biggest changes came when we decide to stop dissociating ourselves. The core faulty belief afflicting dissociates is that we are not worthy. The dangers we perceive doesn’t actually have to be there. We just have to think that it is. the dissociated can reclaim our spirit of the child within. The erosion of this your old dissociation means part of you is set adrift again and you’re not sure when or where your feet will touch bottom. The healthy beliefs of Dissociation Anonymous. The illusion of dissociation is the label of addict or alcoholic. the most basic attitude for dissociation recovery is not an easy practice. The natural development from shadow self to integrated child within is a process of transcending and including. The Self-Absorption Overlay We are all self-absorbed to at least some degree. The Ten Stages is unique in that our recovery manifests from perfect health and refuses to acknowledge the ancient ideas of historic pathology and fear of so called modern therapies. The Ten Stages Study Course means us having the courage to peel back layers of pain and sadness. the truth wakes up. You are not recovered; recovery is recovered. The use of critical words to our child within are as painful and damaging as being physically hit. They freeze our memory with ice to keep us from remembering......But remember we do. This is why we check our email many times a day! Thus we keeps our zero hour job and perpetuates a dead system. To a Dissociate who has suffered deep abuse "self absorption" is absorption in a falsely created shadow self. To evolve into consciousness of our reality without parental baggage we must redeem our child within and heal our past. to interact skilfully with the people and objects that surround them. treated inappropriately for our species. Turning DA changes how people perceive us. Unresolved traumas block our vision from finding our truth. we all do. We are all traumatised due to childhood misfortune and our collective ancestral insanity. we are entirely dependent on our parents. We are truly fortunate who have found the capacity to grieve the horrors of our childhood in the ten stages. Grieving with the child within has opened our doors to inner serenity. We believe in our goodness as caretakers and see ourselves as worthy spiritual people. We commit to a slow passive suicide of dissociation every day. We compensated for lack of nurturing as a child by immersing ourselves in fantasy. We don't need to empower our child Within to trust their nature. We have lost trust in our own essential nature our child within. we have to drop our ambivalence and cynicism. We know with 100% certainty that our trauma is over – the addiction sufferer in front of you does not. We live in a society where the emotional experience of “love” is conditional on behaviour. We live in the world of illusion where chronic conditions are treated with an infectious disease programs of unhealthiness. We need Recovery bypass surgery when our fear blocks us from feeling our feelings and recognising our child trapped within. We never give explanations we stop being our victim! We Take Responsibility we are not powerless but empowered by our child within. we provide a thought for you to carry with you in the day plus a practice. We regain sole ownership of our own vision. We start slowly and gently to unbox our child hidden within life. We understand our ancestral voices and instead see them as a lesson in disguise. We understand when we communicate with the child within that at the core of our problems are all the traumas we experienced as a child. We who are suffering from Dissociation Identity Disorder have been raised in families where our needs are not met. We who have a dissociative addiction disorder may experience too much and intrusions occur. We who have made the decision to complete the ten stages taught course become freed of abuse. whatever it is – it resides in us and actually effects our biology. It affects us more than it does any other person. Why is undisturbed Sleep important. Writing about what life as a member of Dissociation Anonymous feels like is tough. You can discover for yourself the most important and practical thing any human being can ever learn-how to be in touch with your child within. You have sole ownership of your child within vision. Your Child Within knows who you are. Follow Fraser's board The Ten Stage Solution on Pinterest. The Fly-Paper Mind One of the greatest gifts of Loving-Kindfulness is that it allows us to cultivate a solution based mind. 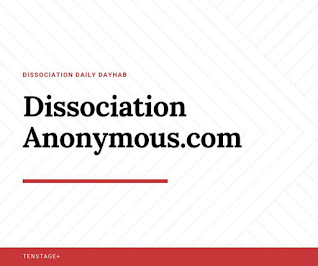 Dissociation Anonymous.com © . All Rights Reserved.